Here’s an interesting question from one reader. It involves recognising a pattern and extrapolating from there. The pattern may not come easily at first – so try to draw it out and analyse. The question is "A teacher arranged thirty pupils to stand in a row, starting from Number 1 to Number 30. Next, for every second pupil, she asked each pupil to sit. Then, for every third pupil, she asked each standing pupil to sit and each sitting pupil to stand. 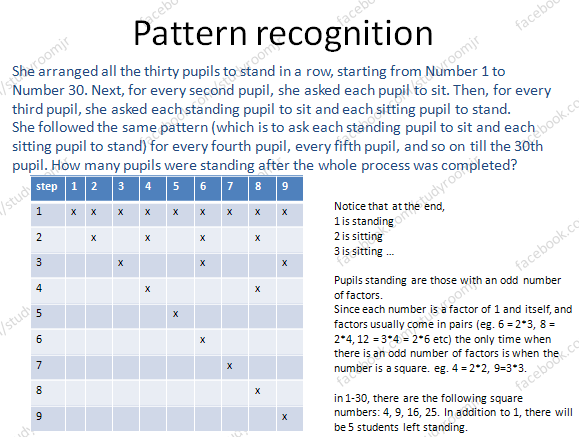 She followed the same pattern (which is to ask each standing pupil to sit and each sitting pupil to stand) for every fourth pupil, every fifth pupil, and so on till the 30th pupil. How many pupils were standing after the whole process was completed?" This entry was posted in Maths and tagged Pattern. Bookmark the permalink.